For a list of participating NNIMIPA institutions, coordinators and committees, please see HERE. scroll down to the purple box on the entry page. NNIMIPA members who attended our October 2013 event in Marseille - see below - had the opportunity to hear Fernando Bravo's prizewinning presentation at The 10th International Symposium on Computer Music Multidisciplinary Research (CMMR), themed Sound, Music and Motion. 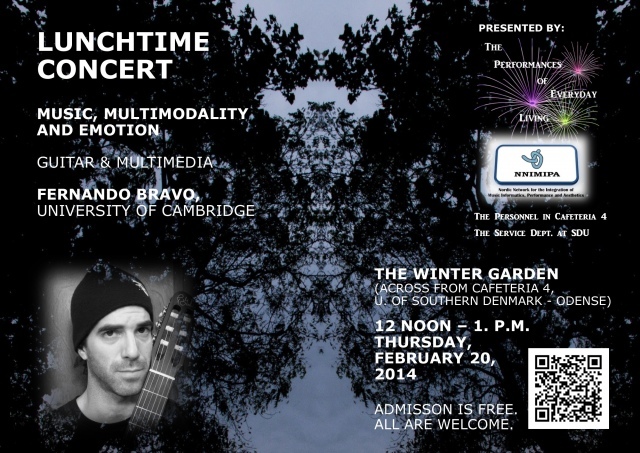 February 20 and 21 Fernando Bravo will present three seminars and give a Lunchtime Concert at the University of Southen Denmark in Odense. All are welcome - also via Skype. Please see HERE for information about and poster for the Lunchtime Concert with Fernando Bravo. NNIMIPA: Nordic Network for the Integration of Music Informatics, Performance and Aesthetics, a NordForsk network, held a satellite session - Music, Movement and the Brain - on October 14, 2013 in conjunction with The 10th International Symposium on Computer Music Multidisciplinary Research (CMMR), themed Sound, Music and Motion, October 15-18, 2013. See the video slide show! Just click on the arrow. For full screen, click on screen icon in the lower right-hand corner. IF YOUR BROWSER DOES NOT SUPPORT EMBEDDING IN THE SPACE BELOW, PLEASE VIEW THE VIDEO AT http://youtu.be/U9DYVvyDA0k. The 10th International Symposium on Computer Music Multidisciplinary Research (CMMR) themed Sound, Music and Motion. Please see http://www.cmmr2013.cnrs-mrs.fr/. More details available here regarding NNIMIPA's session and meeting in conjunction with the CMMR symposium. The 3rd Annual Meeting of the of the Royal Music Association Music and Philosophy Study Group, July 17-July 22, 2013 at King's College, London. Please see here for the NNIMIPA meeting on July 18as part of the pre-conference activities and here for the RMA-MPSG meeting July 19-20. Please see the "News" column on the right-hand side of the page. Concert: Wednesday, December 12, 2012, 12 noon - 1 p.m. on the Campus Square (Campustorvet) University of Southern Denmark, Campusvej 55, 5230 Odense M. Nu er det jul with Nikolaj Nottelmann, tenor, and Cynthia M. Grund, piano.Concert poster available HERE. For information about seminars, concerts and other events, please see the "Calendar" menu tab as well as the "News" Column on the right-hand side of each page on this website. The Lunchtime Concert Series continues on November 1 at the University of Southern Denmark at Odense 12-13 on The Campus Square - see HERE - and the series on Topics in the Aesthetics of Music and Sound continues at 16:15 - see HERE. Please note that this series features several presenters affiliated with NNIMIPA member institutions (for a list of these institutions, please see below). Audience participation by Skype is also welcome! Documentation of the first week of lab work (October 15-18) for the research project Technological and Aesthetic Investigations of the Physical Movements of Pianists with roots in NNIMIPA available as a Flash slide show HERE. The Research Project Technological and Aesthetic Investigations of the Physical Movements of Pianists with Roots in NNIMIPA Brings Together Researchers from Texas Tech University and the University of Southern Denmark. Presentation and video published July 31, 2012 by TTU Academics and Research availableHERE. tirsdag den 27. november (p� dansk). Se HER for detaljeret information og tilmelding og HER for plakat. Tilmeldingsfrist: Senest den 15. november, 2012. 13-seminar series on Topics in the Aesthetics of Music and Sound at the University of Southern Denmark at Odense, starting September 6, 2012 including several presenters affiliated with NNIMIPA member institutions (for a list of these institutions, please see below). Audience participation by Skype also welcome! Please see here for details. Four-day multi-event in London July 19-July 22, 2012 on the occasion of the second annual conference of the RMA-MPSG which will be held at King�s College London on 20-21 July 2012. See here. NNIMIPA joins with the Grieg Research School in Interdisciplinary Music Studies for the June 2012 event UNDERSTANDING MUSICALITY in Bergen, Norway June 22, 2012. Please see here for information. This event is in extension of the GRS international research seminar Researching Music Practices � Methodological Approaches June 18-21. For more information on the GRS seminar, please see here. Please see "Calendar"-tab for a continually updated program. 13-seminar series on Topics in the Aesthetics of Music and Sound at the University of Southern Denmark at Odense, starting February 2, 2012 including several presenters affiliated with NNIMIPA member institutions (for a list of these institutions, please see below). Audience participation by Skype also welcome! Please see here for details. November 21, 2011: New Directions in Musical Performance. Workshop and seminar in the Concert Hall, Academy of Music and Dramatic Arts, Southern Denmark/Syddansk Musikkonservatorium og Skuespillerskole (AMDA/SMKS), Odense, Denmark. 9:30-11:30 Performance workshop "The Un-Master Class" with NNIMIPA-affiliate William Westney. 12:30-14:00 Seminar "The Inquisitive Musician" with NNIMIPA-affiliates William Westney and Barry Eaglestone and NNIMIPA-coordinators/committee members Cynthia M. Grund, Kristoffer Jensen, Morten Heide and S�ren Frimodt M�ller. For details regarding the workshop and seminar, please see here. September 26, 2011: A TV-documentary in English about a Lunchtime Concert with pianist Gustav Krogh Hansen Piekut earlier this year at The University of Southern Denmark, SDU, at Odense airs throughout the week of September 26 - October 2, 2011 on ALT, Aabenraa Lokal TV on the TV S�nderjylland (TV-SDJ) network. The program will be permanently available here and during the broadcast week also here. In addition to concert clips, the program features interviews in which Gustav Krogh Hansen Piekut, Assoc. Prof. Cynthia M. Grund and S�ren R. Frimodt-M�ller, PhD participate. 13-seminar series on Topics in the Aesthetics of Music and Sound at the University of Southern Denmark at Odense, starting September 8, 2011 including several presenters affiliated with NNIMIPA member institutions (for a list of these institutions, please see below). Audience participation by Skype also welcome! Please see here for details. Four-day multi-event in London June 30-July 3 on the occasion of the inaugural annual conference of the RMA-MPSG which will be held at King�s College London on 1-2 July 2011. See here. NNIMIPA: Nordic Network for the Integration of Music Informatics, Performance and Aesthetics aims at shedding new light upon traditional and contemporary questions within music research employing approaches which regard music from a vantage point where information and communication are the focal points, aided by the tools under rapid development within information technology, practice-based research and the new perspectives arising within aesthetics as a result of new technologies for studying and producing music. NNIMIPA was officially established during the 2007-2008 academic year, when funding provided by the University of Southern Denmark at Odense was matched by Nordplus in order to establish this Nordic cooperative initiative. Nordplus continued to provide funding for NNIMIPA activities held during the 2008-2009 and 2009-2010 academic years in the form of grants which were matched by the participating institutions. NNIMIPA became a research network under NordForsk (www.nordforsk.org) on September 1, 2010, with funding during 2010-2013. The decision to award the grant was made by the director of NordForsk following an evaluation carried out by a panel of independent experts. The grant was subsequently extended until June 30, 2014.
www.nnimipa.org was launched on February 23, 2010 as a central site for disseminating information about NNIMIPA and for documenting the activities of the network since its inception in 2007. Book Release: November 11. 2010 was the release date for the print version of Music, Movement, Performance & Perception: Perspectives on Cross-Disciplinary Research and Teaching within NNIMIPA - Nordic Network for the Integration of Music Informatics, Performance and Aesthetics. An essay in words and pictures recounting the NordPlus-sponsored Coordination Meeting for NNIMIPA held at the University of Oslo, February 18-19, 2010. Text: Cynthia M. Grund and William Westney. Photography: Cynthia M. Grund. Online version available HERE.